With a skinny, eel-like shape, Cat Island, Bahamas, is only a few miles wide and 77km (48 miles) long. It's a lush, sleepy island in the southern Bahamian backwater, a great place to get away from it all. Cat Island has an estimated population of 1,647. The main settlements are Arthurs's Town, Orange Creek and Port Howe. Cat Island, Bahamas, is a hook-shaped island stretching about 48 miles long and only four miles across at the widest part. 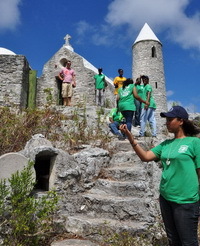 It is in the central Bahamas and boasts the nation's highest point - Mount Alvernia - which rises to 206 ft (63 m). At the top, sits a monastery called The Hermitage, built in 1939. The ruins of cotton plantation can be found scattered around the island. Adventurous souls are free to explore the remains of slave huts and Arawak Indian caves, both centuries old. Rake 'n' Scrape music is popular in Cat Island, and in fact it is where one can experience the finest finest rake ’n scrape music in the Bahamas during an annual festival dedicated to it. The population of Cat Island is roughly 1,647 (2000 census). The main settlements are Arthur's Town (childhood home of Sidney Poitier), Orange Creek, and Port Howe. Some say the island was named after the pirate Arthur Catt, others say it is due to the island's once large population of feral cats. Cat Island offers much to the visitor seeking a remote destination, it is lined with some of the most beautiful, pristine beaches in the Bahamas and much of the island has not been developed. Divers enjoy the island for its numerous caves, coral reefs, blueholes and shipwrecks. Fishing is also a popular activity. There is more than meets the eye to see and do on Cat Island but visitors are also quite welcome to simply relax and do nothing at all. Cat Island is approximately 130 miles by air from Nassau. There are two airports serving Cat Island – Arthur's Town Airport (ATC) and New Bight Airport (TBI). Frequent domestic and international service is available via scheduled and charter airlines. Sea service is provided by mail boats to a number of settlements/towns on a weekly (or more frequent) basis. Explore your options. Regular scheduled charter flights are available to Cat Island from Ft. Lauderdale, Florida and from Nassau. Rates and schedules fluctuate so it is recommended that you call each airline for newly revised schedules and changes, pricing. Sky Bahamas makes daily round trip flights between Nassau (NAS) and New Bight (TBI). 7 days a week. Bahamasair flies between Nassau (NAS) and New Bight (TBI) currently on Thursdays and Saturdays. Charter service between Nassau and New Bight. Contact Beverly Lewis for quotes. Private pilots can be accommodated at The Bight airport, which is 5,000 feet paved and operates under visual flight rules. If you are looking for an affordable and adventurous method of transportation to Cat Island you might consider taking a mailboat. It's not the most dependable mode of transport as the schedule can change due to the weather or the captain's whim. And be forewarned, this is no luxury cruise. While some of the mailboats have air-conditioning and decent sleeping quarters, they are primariy used to transport mail and freight. You could easily end up sharing the ride amidst cars, boxes and even a few goats. Still, this can be a good choice for students, or hardy tourists who want an adventure and are looking to save some money. You can always charter a private boat to get you where you want to go, on your own time. You will find boat charter companies in the Bahamas Web Directory Bahamas Boats & Boating page. Most of the hotels and resorts on Cat Island, Bahamas, have good restaurants or dining facilities on the premises. Cat Island also offers several other restaurants that can satisfy pretty much all pockets and palettes. It may be small island but cuisine from around the globe can be found here with an emphasis, of course, on seafood and authentic Bahamian cuisine. We offer our selection of dining establishments we have visited and from visitors recommendations. Fernandez Bay Village is a remote and rustic island-style resort located on Cat Island. Twelve stone and tile villas dot the private beach which crests a half-moon bay. Guests will find hammocks, canoes, kayaks, seaside dining, a thatched roof tiki bar, fishing, snorkeling, scuba, boats and bicycles to occupy their time. The resort also has a restaurant, library, barbecue grills, and gift shops/newsstands and high-speed wireless Internet access is complimentary. Located at Port Howe, Cat Island, Greenwood Beach Resort sits on an 8-mile stretch of beach. The 16-room resort has been described as charming, unique and quaintand boasts 85% return visitors. Guests enjoy beach bonfires, diving, snorkeling, bonefishing, kitesurfing and crabbing... or just relaxing in a hammock under a shady tree. The Bridge Inn is a family-run hotel located at New Bight on Cat Island. It features 12 guestrooms and 6 two-bedroom condominium units just a few meters from the beach. The rooms are accented with natural stone and feature a private bath, sun porch, air conditioning and satellite TV. The Bridge Inn Restaurant serves up locally-sourced Bahamian specialties for breakfast, lunch, and dinner. Located on the southern tip of Cat Island Hawk's Nest Resort & Marina is a beachfront paradise with a 4-star rating. The resort features newly remodeled deluxe accommodations, fine dining, a pub, marina, PADI dive center, activities, a private airstrip and a young, enthusiastic staff. The resort has been an extraordinary full service PADI Dive operation since 2000 and guests return for the spectacular scuba diving. Island HoppInn, on the private beach of Fernandez Bay, has a very personal atmosphere that gives you immediate and lasting comfort during and after your visit to our tropical paradise. Island HoppInn shares the same beautiful beach with Fernandez Bay Village, but it operates independently with different vacation packages and activities. Activities include fishing charters, guided tours, scuba diving, snorkeling, secluded beach walks, sharing colorful sunsets and stargazing. Guests are welcomed with a delicious Welcome Rum Cake. Laid back and casual, Pigeon Cay is located in the Northern area of Cat Island, 3 miles south of Bennetts Harbor, on one of the most beautiful beaches in the Bahamas. With seven handcrafted custom designed cottages Pigeon Cay Beach Club is a small private property where personalized service for each guest is a priority. Amenities include air conditioning and internet access. Sammy T's is a small, secluded beach resort surrounded by beautifully landscaped grounds, located right on the beach at Bennett's Harbour, Cat Island. Sammy T's boasts even tastefully furnished private villas and customer service that keeps visitors coming back over the years. The resort has a private beach within its cove, and guests can enjoy watersports, snorkeling, sailing, fishing or just sunning. There is a restaurant on the premises, a gaming area and fitness area. Located at Orange Creek, Cat Island, Shanna's Cove Resortis the ideal place for those seeking rest and relaxation. The resort has five brightly decorated beachfront bungalows positioned on a secluded beach and guests will experience soft ocean breezes wafting into their rooms. Each room has air-conditioning, ceiling fans and a sun terrace. The resort’s restaurant is a gastronomic pleasure featuring delightful international dishes and exotic island specialties. Probably, the biggest "thing-to-do" on Cat Island is to do nothing at all. Sure, it's all here for you to do - fishing, snorkeling, kayaking, scuba diving - but you may appreciate the peaceful serenity so much, you end up doing absolutely nothing but enjoying it, which is fine. With its pristine virgin beaches, Cat Island is one of the most beautiful islands in The Bahamas, and it is so little visited that it´s inexpensive and still feels undiscovered. Many local historians claim that Cat Island residents were the first to see Columbus. The great explorer himself was believed by some to have been welcomed here by the peaceful Arawaks. Beautiful beaches offer an array of water sports. Visitors can go swimming or snorkeling at several places. The island´s north side is wild, untamed shoreline. Boating and diving are among the main reasons to go to Cat Island, and diving lessons are available for novices. The Cat Island Dive Center at the Greenwood Beach Resort (tel. 242-342-3053) will take you out on diving or snorkeling excursions, or rent you snorkeling gear and other water toys. There's an interesting Arawak cave at Columbus Point on the southern tip of the island. In addition, you can see the ruins of many once-flourishing plantations that saw their heyday during the island's short-lived cotton boom. Early planters, many of them Loyalists, marked their plantation boundaries with stone mounds -- some of which are now nearly 200 years old. The ruined plantations include the Deveaux Mansion, built by Col. Andrew Deveaux of the fledgling U.S. Navy (who recaptured Nassau from the Spanish in 1783), and the Armbrister Plantation, which lies in ruins near Port Howe. You can also hike along the natural paths through native villages and past exotic plants. Finally, you reach the peak of Mount Alvernia, the highest point in The Bahamas, at 62m (206 ft.) above sea level, where you will be rewarded with a spectacular view. The mount is capped by the Hermitage, a religious retreat built entirely by hand by the late Father Jerome, the former "father confessor" of the island, who was once a mule skinner in Canada. Curiously, the building was scaled to fit his short stature (he was a very, very short man). Formerly an Anglican, this Roman Catholic hermit priest became a legend on Cat Island. He died in 1956 at the age of 80, but his memory is kept very much alive here. For the nature enthusiast Cat Island has some intriguing natural wonders. For example, Armbrister Creek flows into a clear lake called "Boiling Hole" where the tidal flow causes bubbles and burps. This has led to Cat Island folklore of a sea monster below its surface, but it is really just a great spot to catch a glimpse of rays and baby sharks. Those interested in the island's history can learn more at Columbus World Centre Museum in Knowles, or visit the childhood home of Academy Award winning actor Sir Sidney Poitier. Cat Island Bahamas is a prime choice for a weekend getaway or an extended stay. Several airlines offer service to Cat Island. Take either a short flight from the East Coast of Florida or a quick hop from Nassau or Grand Bahama where there is good connecting service from all destinations around the world.